I don't get the online hype about Google plus. I usually see these from the different review websites that I follow, but among friends and family--my inner circle, there is not a single mention. At one time, I made an effort to connect with those who use Google plus. 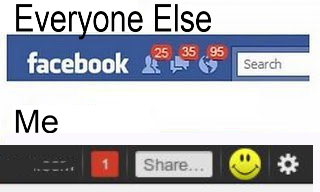 I have more than three hundred names on my Facebook list. Only two were active enough on G+, meaning, they update every now and then. Why can't Google make better use of Social Proof? They did. They have tried every angle using social proof, but perception trumps social proof on any given day. Remember my idea about motivation? People will move towards that which they perceive is good for them, and move away from that which they think is not good. The common perception is that Facebook is good. In fact, it is better than all the rest. Everyone's inner circle is on Facebook, not on Google plus. How can Google plus use perception to change motivation? Good question. Answer: it can't. Google presents itself as another social network. A clone of Facebook. That positioning is already taken by Facebook. No matter how much bling Google uses, it's not going to take the place of Facebook. So how did Facebook take the pole position from all the other social network sites in its early days? I am not quite sure, but using perception and motivation, I can guess an answer based on my own experience. Back then, I was using Friendster. I've heard of Facebook, but did not bother looking into it. One day, a cousin suggested I try Facebook. To my surprise, everyone I know in friendster was already in Facebook. To top things off, everyone else I knew from the past that I couldn't find on friendster, was already in Facebook. This changed how I saw things. Facebook, in my perception, was better than friendster. It was only natural that my motivation is to use Facebook then friendster. Looking ahead, the only way Facebook can be upstaged is when technology takes a big step in evolution. Think back when Yahoo was THE search engine of choice (at least for me). But when Google came along, Yahoo, and all the other search websites suddenly became a ghost town. When technology evolves, perception becomes easy to mold. People are open.